These charming 850 sq. ft. 1-bedroom cabins with an additional luxury pull out queen sofa bed can sleep four (7) comfortably. 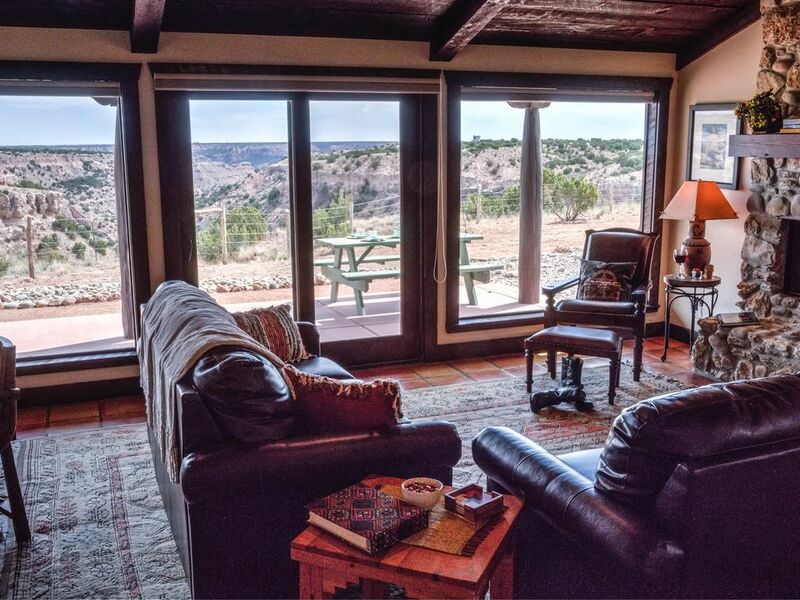 Wood burning fireplaces and dramatic canyon views situated on the Palo Duro Canyon North Rim make for a quiet getaway from city life. Situated on the working Palo Duro Longhorn Cattle Ranch and just moments from the entrance to America’s most beloved State Park - Palo Duro Canyon. Maverick Cabin is a destination on most traveler’s bucket list. These Doves Rest 1-Bedroom Cabins embodies Palo Duro’s character, blending the West Texas legendary ranching past with the relevance of Americas second largest canyon. Our North Rim Cabins are sure to engage the senses and captivate the imagination of our global guest clientele. Doves Rest Cabins manages other private residences at Palo Duro Canyon. Please check our other HomeAway/VRBO listings to book your preferred dates, or book all our cabins for that special group occasion! VRBO listing #723444 for SKYHOUSE, VRBO listing #739931 for CHAIRLIFT, VRBO listing #801442 for COMANCHE, VRBO listing #668390 for FORTRESS. Jeff Means is the founder and manager of Doves Rest Cabins. He’s an experienced business professional with a 30+ year career in the hospitality & tourism industry. He has overseen countless event executions and destination/resort marketing efforts. He has personally led groups to over 50-countries and worked closely with resorts and hotels to enhance the guests stay and overall experience. He has traveled to every continent except Antarctica, and almost every state/province in the U.S., Mexico and Canada. During his career he has been to many interesting places such as, the Sahara Desert, Amazon River, Great Barrier Reef, Moscow, Marrakesh, Transylvania, Kenai Peninsula, and the Alps from every country, plus most of the Caribbean Islands. Jeff’s sister lives in New Zealand who he visits occasionally. Interestingly, she has several successful vacation home rentals projects in New Zealand, Australia and Argentina! Jeff is also an author and accomplished writer. His extensive travels have given him a unique view about the world and the cultures in which we live. His curiosity about world and human origins led him to write his debut novel, Entity of Origin. Jeff was born and raised in Northern California but has called Texas home since 1989. Palo Duro Canyon State Park with it's Technicolor walls make for high-desert scenery more commonly seen in southern Utah. It offers more than 30-miles of hiking, mountain-biking and equestrian trails and an additional 1,500 acres set aside for horseback riding. You can bring your own horses so don’t hesitate to ask us about local boarding. Mountain bikers can experience the best single track in Texas and will enjoy the well maintained five trail heads networking for some 26-miles throughout the canyon ranging from "mild" to "wild" in technical ability - dirt, rocks, river rock, sand, wash-outs, switchbacks, drop-offs and climbs with alternative trail accesses throughout. During the summer, enjoy a performance of the outdoor musical drama TEXAS. The play, nearing a half-century in its on-going production runs Tuesdays through Sundays, June through August, at the 1,700 seat Pioneer Amphitheater. Watch the stories, struggles and triumphs of early settlers. The family-friendly show has singing, dancing, fireworks and lots of Texas humor. You'll find Doves Rest a place of amazing beauty, quietness and nurturing of soul & spirit. Palo Duro Canyon embodies Texas’ sense of place and spirit like few other areas in the state. Doves Rest Cabins is honored to provide the world’s only private overnight luxury accommodations to intrepid travelers, offering unique views and an iconic symbol of the American Southwest for our guests to enjoy. Wildlife diversity and abundance around Doves Rest is excellent, including populations of blue quail, bobwhite quail, Rio Grande turkey, bobcat, mule deer, white-tailed deer, Barbary sheep, coyote, roadrunners, skunks, rabbits and numerous songbirds. Fun memories and RELAXATION happen here! Off the beaten path and outside of mainstream destinations, we are far from every other place to stay. We deliver an amazing guest experience that is truly authentic Texan, personal, and character-rich. Doves Rest Cabins is truly a unique base camp from which to explore one of the world’s most transformative place – Palo Duro Canyon State Park. Doves Rest Cabins is ideal for travelers who believe small is beautiful, and see travel not as something one does, but rather identifies it as part of who one is. If private and quiet surrounded by nature with friendly wildlife nestled in your own little world only a few minutes away to the second largest canyon in America interests you, then you’re in the right place! We have multiple cabins at Doves Rest so please contact us for your group needs. Concierge Service – Don’t have time to shop? Let us take care of your grocery list for you. We’ll buy and deliver your groceries upon your arrival including liquor, beer, wine and beverages. We know the premiere butcher shops for the finest cuts of Texas Panhandle beef, locally made sausages, chicken and fresh fish. Fee starting at $40.00, plus cost of groceries. 48 hour advance notice requested. What an amazing place to stay! Beautiful cabin views! Cabin had everything we needed for a nice stay. Could give better directions in email and the lock on the door was a challenge but did not keep us from enjoying the wonderful cabin. The cabin was impeccable. The view was outstanding. We did not want to leave. The bed was the most comfortable night sleep I ever had. Will definitely be back. The view from the living room, kitchen, and outdoor porch is amazing! From some locations in the house you feel like you are actually in the canyon. The house was cozy with two spacious beds in two different bedrooms. We grilled out on the deck and had a restful stay there. Thank you! Every detail was thought about in the design and aesthetics of these cabins. Well-appointed, beautifully decorated with every convenience thought about. And the setting is absolutely breathtaking. Can't wait to return! Cabin was clean and well stocked. The views were amazing! With amenities to insure a percent stay!! !